Uruguayan Frente Amplio Senator and wife of outgoing President Jose Mujica, Lucia Topolansky, is running for mayor in Montevideo. Among her proposals, should the 70-year old be elected, is to ensure that hot water dispensers are available for free throughout the capital city. Topolansky’s plan might sound ridiculous at first, but Uruguay is one of the largest Yerba mate consumers in South America and drinking mate “on the go” is a deeply rooted custom among most of the country’s inhabitants. It is quite normal to see staff attending to customers with a thermos under their arm, in the streets, in offices, everywhere. Due to this, making sure that the population has access to hot water at just the exact temperature is actually a major contribution and a service to a huge portion of the population. According to Topolansky’s team, these water dispensers would be located mostly in key parts of the emblematic Rambla de Montevideo, a 22 km avenue which stretches along the margins of the Rio de la Plata. This area is the most visited by tourists who come to the Uruguayan capital and is also where locals tend to concentrate on weekends, in short, where the population spends much of it’s leisure time. Lucia Topolansky’s proposal is that the hot water never lacks: free and ready to consume, at just the right temperature. While Mate is an established custom in several South American countries, it is Uruguay that presents the largest consumption per capita. Figures indicate that 85% of the population drinks mate daily. Nearly ten kilos is consumed per person per year, resulting in a total national consumption of about 29 million kilos per year. 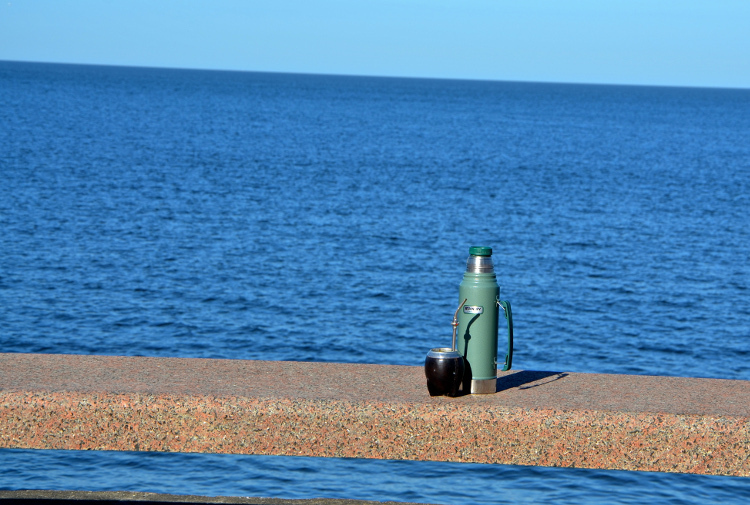 Undoubtedly, the greatest Uruguayan contribution to the culture of drinking mate was the use of thermos flasks. This made it possible to bring mate virtually anywhere: Walking down the street, on the desks of offices, behind the counter in shops, in football stadiums, at home, in parks, on beaches, anywhere is good for drinking mate. If Topolansky succeeds, then Montevideo is well on it’s way to becoming the yerba mate Mecca of the world. With it’s economy doing way better than it’s neighbors and Human Development indexes on the rise, Uruguay might just be the guiding light to the rest of the Southern Cone.